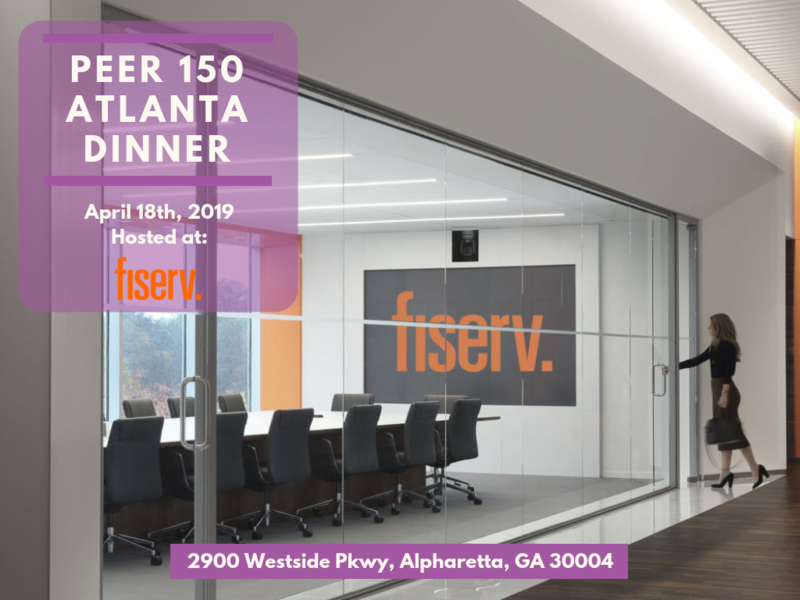 The Atlanta members of The PEER 150 are honored to host an evening of networking and content at Fiserv Headquarters. Attendance is open to senior human resources executives approved by our PEER 150 team. We look forward to seeing you on Thursday, April 18th! How can HR be a champion for culture within the company and other initiatives like diversity, recruiting and staffing and university relationships? What are lessons learned around “culture misses” in a high growth environment that need to be remembered? The workforce today wants a connection – to be part of a company and workforce that matters. They want a clear understanding of business realities, what is going well, what isn’t, what customer feedback indicates misses and opportunities for improvement. They also want top leadership that is frequently engaged, to feel connected with leadership. Are leadership actions connected with the communicated values and growth strategies? In short, are they taking action on what they discuss? How can HR help bridge that gap? HR has a big opportunity weigh in with growth enablers, with people and to be the pulse of organization. Is HR approachable and credible? Do people see that their inputs, both good and bad, are listened to? Do they see changes made that HR championed based on their input? For more information about sponsorship, please contact MadeleineGrubb@thepeer150.com. Accolade is a personalized health and benefits solution that dramatically improves the experience, outcomes and cost of healthcare for employers, health plans and their members. With a unique blend of compassionate advisors, clinical experts and intelligent technologies, we engage individuals and families in their health, establish trust, and influence their decisions at every stage of care. Accolade consistently achieves 70 and higher Net Promoter Scores, 98% consumer satisfaction ratings, and up to 15% employer cost savings. Accolade has been recognized as one of the nation’s 25 most promising companies by Forbes, a fastest-growing private healthcare company by Inc. 5000, and is consistently rated a Top Workplace across the country. For over 20 years, CareerBuilder has been at the forefront of innovation when it comes to using data and technology to evolve the human capital management space, with solutions that help employers find, hire and manage great people. About Us. What We Do. Our Products. Why CareerBuilder. Fiserv is a global leader in financial services technology solutions. We’re helping more than 12,000 clients worldwide create and deliver experiences for a digital world that’s always on. Solutions that enable today’s consumer to move and manage money with ease, speed and convenience. At the point of thought.